"Never has the need been greater, than it is today, for Australia's leaders and decision-makers to have access to authoritative scientific information on Australia's vast region of marine responsibility; I use "region", seeking to direct attention beyond the superficial "area" and the vastly greater "volume" of oceans, further, to the solid ground that lies beneath the waters of our EEZ, and beyond." "Every major branch of science is potentially relevant to the challenge of wise management and sustainable development of the marine region, and the topics of all those branches are interactive and interdependent in addressing that challenge." "The Australian Marine Sciences Association - AMSA - is the professional body constituted to address that information-need, at local, State/Territory, and National levels, individually, as well as through our Branches, and Nationally, through our National Council." "Each and every AMSA member has the responsibility to communicate with leaders and decision-makers in their local communities of Australia to ensure that marine issues are considered, and opportunities are realised." "Today and every day - be known in your own community as a respected AMSA Scientist." "Always remember - Talk to people in power, before you need them". 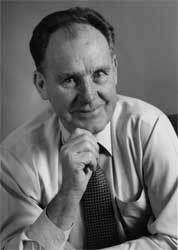 Professor Joe Baker AO, OBE, FTSE, FRACI, C.Chem.